The Calico Shoppe is located in Downtown Eau Claire, WI which offers unique specialty shops, all within 2 1/2 blocks. 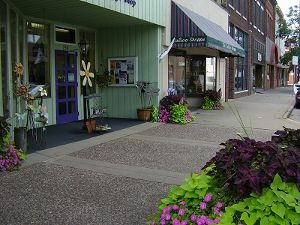 Downtown Eau Claire has a Quilt shop, Yarn shop, antiques, and 8 gift shops! There is also the Children's Museum, and great restaurants, coffee shops, and entertainment. Explore today. Thursday evenings you will find many of the downtown businesses open, including The Calico Shoppe and our Purple Petunia gift shop! The Calico Shoppe sends out email notifications whenever something new and exciting is going on. We also publish a quarterly newsletter filled with upcoming activities. If you wish to receive both of these fill out both sections below and click submit.